We use 5 stages of filtration to remove dissolved solids thus creating ultra-pure de-mineralised water (with zero parts per million). Washing with normal tap water leaves spots and smears on windows as minerals are left behind. Our ultra pure water absorbs the dirt and chemicals it comes across on the windows as it strives to return to its natural impure state. This makes it an extremely efficient and effective cleaning agent without the need for detergents. As the water is pure it can be left to dry naturally without leaving any marks behind, giving a spot free finish. Our windows stay cleaner for longer than using traditional window cleaning methods as we do not leave a sticky soap residue which attracts fresh dirt to the window. 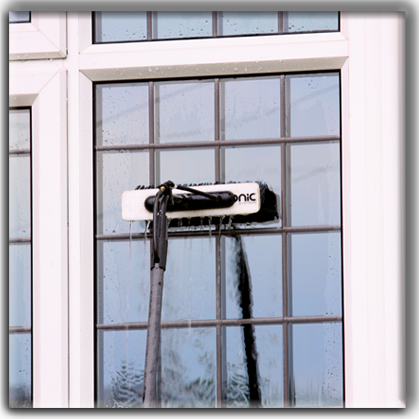 When first starting with pure water cleaning, the windows may initially look spotty or have runs down them. This happens because the pure water gets into every nook and cranny, bringing out the dirt and soap residue. It may take up to 3 cleans to get a spot free finish.